North Carolina College was opened in 1852 in Mount Pleasant as Western Carolina Male Academy. The school was organized by the North Carolina Synod of the Lutheran Church as "a high school of collegiate character." It consisted of a three-story brick building and a president's home, with William Gerhardt of Pennsylvania as president and professor. In 1859 the synod decided to have the charter amended in order to change the academy to a degree-granting college, and the institution became known as North Carolina College. The college's prospects for many years of service seemed bright until its work was interrupted by the Civil War and many of its students entered the army, its professors resigned, and the school closed. In 1866 the college reopened with Louis A. Bikle as president. The first class was graduated in 1871. Many of the graduates entered the ministry, and some became leaders in church and state affairs. North Carolina College never recovered from its troubles during the Civil War and the loss of its endowment, however. In 1901 the synod, in a decision agreed to by the college's board of trustees, decided to suspend operations at the end of the 1901-2 academic year. From 1902 to 1933 Mount Pleasant Collegiate Institute, a secondary school, operated on the grounds that once housed North Carolina College. Annie Hoover, "Two Fine Old Schools," Uplift 31 (June 1943). 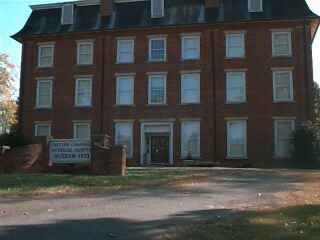 Mount Pleasant Institute, on the site of North Carolina College. Available from http://www.ncmarkers.com/Markers.aspx?ct=ddl&sp=search&k=Markers&sv=L-65%20-%20MOUNT%20PLEASANT%20COLLEGIATE%20INSTITUTE (accessed November 9, 2012).